Welcome to the Forum and wish you many safe trips. Nice looking coach. Welcome to the forum. If you add your coach information to your signature it will help you get better answers when you ask questions. Welcome to the forum where we are all learning! Enjoy your coach, the more you use it the better your investment! Reeltachy. Welcome to the Forum! Feel free to repeat yourself, we do! It's when your daily new friends, where over for dinner last night, that your in real trouble! Paint job on your rig is nice, I'm partial to blue. Safe travels! Welcome to your new Family, FMCA. Your now have 74,000 new cousins. Also Welcome to the FORUM. Many of us have passed RV-101 and are now into RV-102. As far as I can tell no one has every completed the course as long as they own a Motor Home. Just as you think you have experienced it all something else comes up. But the nice thing about the FORUM is that several others have "Been there, done that and have more than one Tee Shirt for it." Loving in Tampa you are in the Southeast Area of FMCA. (there are 10 areas for FMCA) The AVP, Area Vice President, for the South East is Betty Duncan. If you have any question feel free to email Betty at bduncanfmca.com. She can help you with Chapters and Rallies in you area. By the way if you can get to Texarkana, AR by the 25th you can join us at the Six-State Rally. Come on over the weather is great. Sharp looking coach for sure. Welcome. FNG here as well but I can tell you one thing, you're in the right place. There is a wealth of knowledge here and they are willing to share. Safe journey. Welcome to FMCA and the Forum. Great looking motorhome!! I purchased my first ever motorhome two years ago as my family out grew our travel trailer. The motorhome is used for weekend adventures as I'm still some years away from retirement (dang it!). Thinking about Herman's comment (which are always fantastic!) after two years I'm still in Motorhome 101 class which is much more challenging that my previous Travel Trailer 101 and 102 classes. 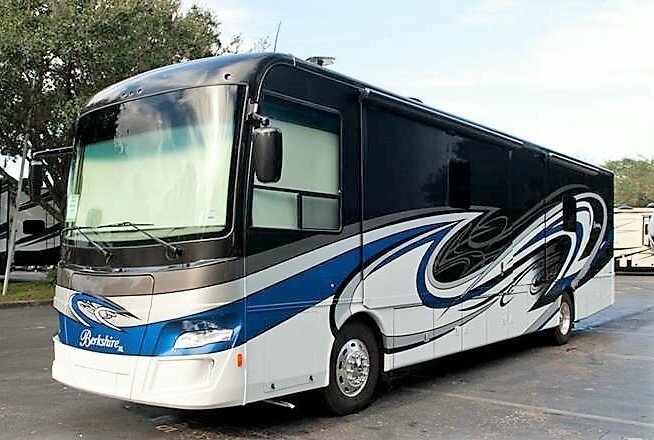 It's all that new "chassis stuff" and more "coach stuff" that makes Motorhome 101 more difficult to master and why FMCA, which exclusively focuses on motorhome owners, is such a valuable resource. Someday I may graduate to Motorhome 102 class. Don't ever hesitate to ask the Forum for help and ideas! My prayers are with you and your family for many safe, enjoyable adventures with your new home on wheels. You have great times ahead! If you find 102, please let us know! 50+ years and I'm still learning something new each day!